Highlights Anit-bacterial Filter: Yes EER: 3.15 W/W Power Consumption: 1460 W Noise db : 35 db Type: Split Refrigerant Gas - R-22 Cooling Capacity: 4600 W Running Current - 6.7 Amps Capacity: 1.5 Star: 3 Remote: Yes SUPC: SDL060104403 Specifications General Brand LG Model LSA5PW3A Colour White In the box Box Contents Main Unit, Remote control General Features Type Split AC Capacity 1.5 Tonnes Star Rating 3 Star Compressor Rotary R22 Panel Display Digital Performance Features Air circulation (In) 425 CFM Air Circulation (Out) 1550 CFM Noise Level - Indoor 35 dB Filter Types Anti-bacterial Filter Yes Dual Protection Filter Yes Air Swing Auto Air-Swing (Up-Down) Yes Other Functions Speed Setting 4/3 Auto-Restart Yes Auto-Clean Yes Sleep Mode Yes On-timer Yes Off-timer Yes Dehumidifier Yes Night Glow Buttons on Remote Yes Power Specifications Power Supply - Voltage 230 V Power Supply - Phase Single Phase Power Supply - Frequency 50 Hz Dimensions - Main Unit Main Unit - WxDxH 890 x 216 x 280 mm Main Unit - Weight 10 Kg Dimensions - Outdoor Unit Outdoor Unit - WxDxH 810 x 270 x 568 mm Outdoor Unit - Weight 38 Kg Warranty Compressor Warranty Period 5 Years Manufacturer Warranty Body Warranty Period 1 Year Manufacturer Warranty Installation & Warranty 1 Select the Installation option (it may or may not be available at your pin code). 2 Item is successfully delivered. 3 Service provider will call back within 24 hours of delivery of the product to schedule the installation. 4 Engineer will visit you within 3 business days OR at your preferred time. 5 The approximate charges for standard installation are in the range of Rs.1200/- to 2000/- . Please note that these charges may vary depending upon your location, cost of extra work/components, taxes and other factors. These charges are to be paid by the customers at the time of installation. 6 Your Item is installed successfully!. 7 In case of any issues, kindly call up our dedicated installation helpline number 9212692126 for assistance. We will be able to facilitate installation/product demonstration in selected locations. Kindly refer to the installation support link (http://www.snapdeal.com/page/installation-services). Warranty Period 1 Year Comprehensive, 5 Years on Compressor Description Do not wait for summer to take you by surprise while you debate whether or not to buy an air conditioner this year. The LG 1.5 Ton 3 Star LSA5PW3A Split Air Conditioner is the perfect blend of elegance and performance that you are looking for. Available in a Pearl White colour, this air conditioner is energy efficient. You can buy it at a great price on Snapdeal, not to forget the 1-year comprehensive warranty and 5-year compressor warranty that accompanies it. AC Type This 3-star split air conditioner is very efficient and does away with the need for leaky ducts. It can be installed on interior or exterior walls and this is what adds to its charm. Power Consumption The 3-star energy rating puts it a step above many of its peers. 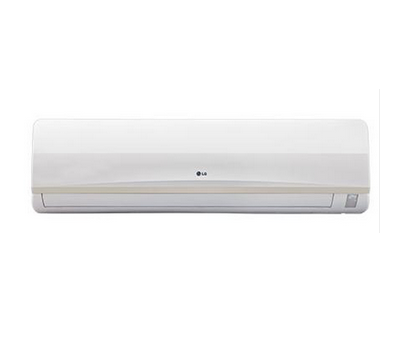 Requiring a 230 volt single phase power supply of 50 Hertz, the LG 1.5 Ton 3 Star LSA5PW3A Split Air Conditioner promises to cool the instant you switch it on. The Monsoon Comfort feature helps save energy by about 36 percent through appropriate cooling when the humidity levels are high and during the monsoons. This is done by maintaining the right balance between room temperature, body temperature, air flow and movement. Technology Used The air circulation input is at 425 CFM while the output number is 1550 in the LG 1.5 Ton 3 Star LSA5PW3A Split Air Conditioner. It provides 7-level humidity control through the Monsoon Comfort feature. This air conditioner features a multi-flow condenser that has an anti-rust coating. These condensers are more effective, durable, and energy-efficient than conventional condensers. Hassle Free Operation The unique Himalaya Cool technology used in these air conditioners starts the cooling process the moment it is switched on. An abundance of features such as Auto Clean that dries the wet heat exchanger and prevents mould and bacteria from forming, Auto Restart and Sleep Mode can be seen in this humid controlling air conditioner. All of these are enabled with just the click of a button. Activating the Sleep Mode will adjust the room temperature to keep it in tandem with your body metabolism rate during sleep. This results in the perfect blend of energy-efficiency with comfort. Remote & Front Panel Display The wireless LCD remote control that comes with the LG 1.5 Ton 3 Star LSA5PW3A Split Air Conditioner also has nightglow feature that makes it easy to adjust the settings in the dark. Use it to switch on the Sweet Dreamz Mode, which will black out the display on this indoor easy to use ac unit while you sleep. Auto Swing and Louver Movement The auto air swing takes place in an up and down motion to ensure uniform cooling throughout the room. The swing can be stopped and switched on with the remote. Compressor Type The rotary R-22 compressor functions with a power input of 1460 watts. The features of this compressor include great power with minimal noise while conserving energy. Dust Filter The dual protection filter in the LG 1.5 Ton 3 Star LSA5PW3A Split Air Conditioner captures minute dust particles and allergens, thus purifying the air in the room while it cools. It is easy to remove, providing ease of maintenance not just when cleaning the filter, but the auto swing air conditioner itself. Low Noise Level The quality components used in this air conditioner ensure that the noise level does not rise above 35 dB. This ensures that even a fussy baby can have an undisturbed night of rest.